Your friend calls to remind you about tonight's pot luck. Oh no! You were supposed to bring a dessert, but you completely forgot! What now? What in the world can you make without having to take the time to make a list and go to the store? Well, if you're anything like me and you love to bake, you probably have the ingredients on hand to make a cake, which will feed plenty of party-goers! Anyone who does a lot of baking probably keeps at least the basic baking staples in their pantry. Flour, sugar, butter, powdered sugar, vanilla extract and nuts are just a few of the baking staples I always have on hand. Something else I always have is fruit in the freezer. I love to use frozen blueberries for whipping up quick muffins or scones on the weekends, and frozen fruit is always great to use for making smoothies. When this challenge came up, we were only allowed to use what we had on hand at that time. I happened to have some frozen peaches in the freezer, so I thought I'd experiment by using them in a layer cake. The nice folks at Good Cook shared some awesome products with those of us in 37 Cooks who were able to take up this challenge. I loved the set of Good Cook Nonstick Round 9" Cake Pans. My cakes came out of the pans so easily, they were evenly baked and the golden color on the bottom and sides was so pretty (which is why I decided not to frost the sides.) 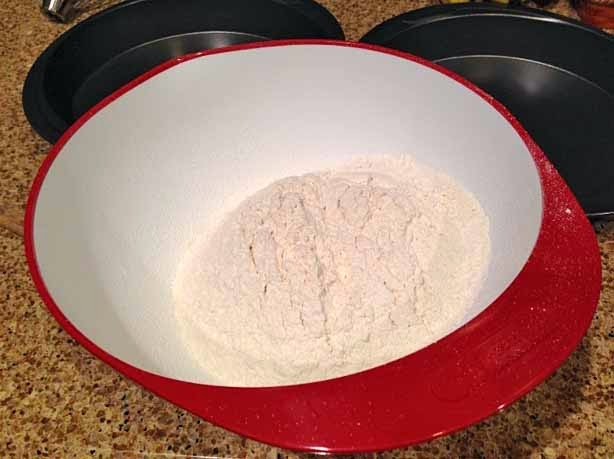 The mixing bowl has a handle on the side, which was perfect for holding on to while adding my flour mixture to the batter. It also has a non-slip rubber base. The Good Cook Silicone Spatulas are very sturdy and they come in a 2-pack (one can never have too many spatulas.) And I love that the Good Cook 4-Pack Flexible Chopping Mat set comes with mats in 4 different colors so you can use each color for a different purpose, such as one just for veggies, one just for meat, etc. So, what did I discover in taking up our Good Cook Potluck Pantry Panic Challenge? I discovered that you really can make a pretty layer cake in a pinch. Getting the cakes in the oven took me less than 30 minutes. Total baking and cooling time, less than 90 minutes (during this time you can be getting showered and dressed for the party.) Whipping up the buttercream frosting, spreading it on the cake and running out the door? Just a few minutes! First, spread out those frozen peaches on a cookie sheet and get them thawing while you get everything else together for the cake. Preheat oven to 350°F. 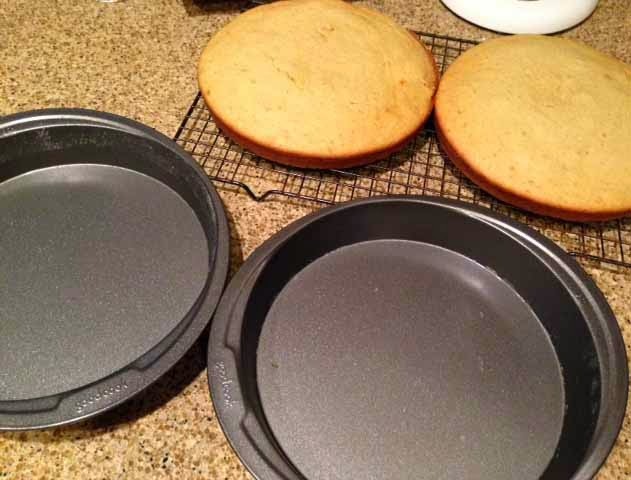 Grease bottoms and sides of 2 9-inch Good Cook round cake pans with cooking spray and then lightly flour. Set aside. In the Good Cook mixing bowl sift together flour, baking powder, baking soda and salt and set aside. Soften 1 cup of butter in microwave for 10 seconds and give it just 5 more seconds if needed. Don't microwave any longer than this because you don't want the butter to melt (at this time, you can also remove the 3/4 cup of butter needed for the frosting from the refrigerator so it can soften on the counter until you're ready to make the frosting.) In large mixing bowl on medium speed, beat the butter for 30 seconds. Gradually add sugar and beat for about 2 minutes, scraping sides of bowl with a spatula. Add eggs one at a time, beating well after each addition. On low speed, alternate adding flour mixture (in thirds) and peach mixture (half at a time), beating just until blended (don't over-mix and be sure to keep scraping sides of bowl with a spatula.) Evenly divide batter between the two pans. 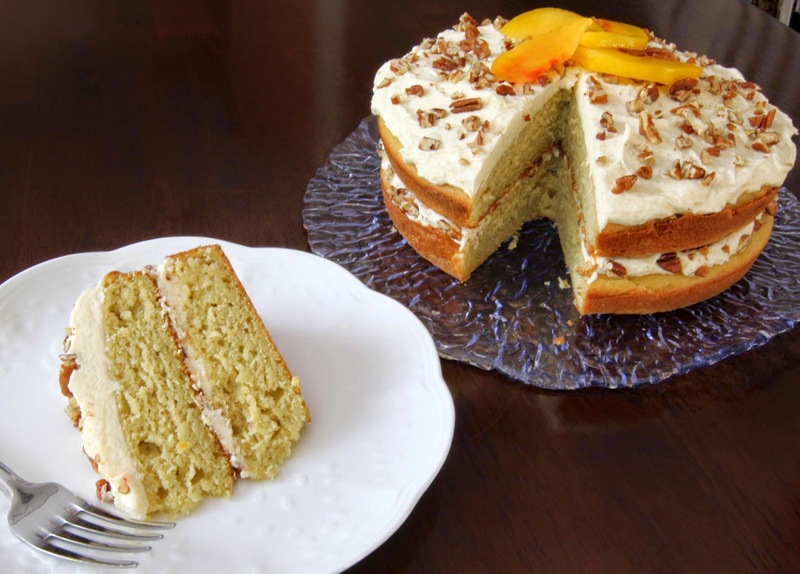 Frost with Buttercream Frosting (recipe below), sprinkle on pecans and decorate the top with peach slices if desired. In a large mixing bowl, beat the butter until light and fluffy and then add the powdered sugar. Beat until thoroughly combined. Add peach puree and vanilla and beat again until nice and smooth. Frost top only of the bottom cake layer and sprinkle on half of the chopped pecans. Place top layer on the bottom layer, frost the top only (don't frost the sides.) Sprinkle other half of the chopped pecans on top and decorate with fresh peach slices if desired.